Arizona is still home to ozoners that are both open and closed. See them here at Roadside Peek's Drive-in Theatres Arizona. To some, Southern California is driven by the automobile and not vice versa. 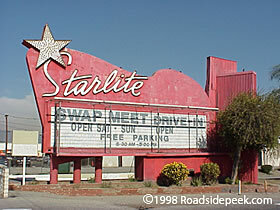 See the drive-in entertainment here at Roadside Peek's Drive-in Theatres Southern California. Well, Northern California is no slouch in the air of car culture and drive-ins. 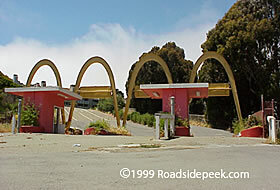 See why at Roadside Peek's Drive-in Theatres Northern California. 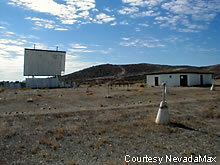 How about Nevada and their drive-in theatres? See them here at Roadside Peek's Drive-in Theatres Nevada. How about New Mexico and open air entertainment? Well, check out what's left at Roadside Peek's Drive-in Theatres New Mexico. ©1998 to 2011 RoadsidePeek.com, All Rights Reserved.